Owner and Founder, Joani Maskell, started teaching lessons in her own backyard, helping neighborhood children learn to swim. She also taught swimming while in college where she earned her B.A. and M.A. in Elementary Education and Special Education. While working with Girl Scout troops throughout the years, she renewed her American Red Cross Life Guard, WSI and CPR & First Aid certifications numerous times. She is certified through the U.S. Swim School Association in Infant, Toddler II & III, through AAPAR in Adaptive Aquatics (working with people with disabilities) and Swim Whisperers/Swim Angelfish - working with students with Autism. In 2006 & 2013, she was certified by the Department of Parks and Recreation in Aquatic Facility Operator. 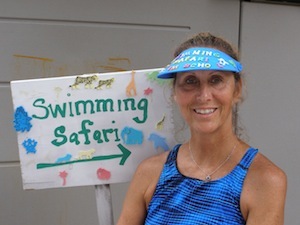 She has taught swimming for over 25 years and is an experienced “Mom.” Swimming Safari Swim School was incorporated in 2006 after Joani attended US Swim School Association Conference, trying to increase her knowledge, where Joani found out that doing what she loved, could be more than just what you did when you were a teenager. With the mission to provide Northeast Florida with professional child-centered swim lessons, she once again taught from her backyard. After finding people who drove from all over town to come to swim lessons, Joani decided she needed to bring quality swimming lessons to other parts of the city. She approached numerous hotels, apartment complexes and other facilities to try to have them become a partner in helping to keep kids safe. Our program has grown steadily over the years as a result of our ability to create an environment where students of all ages learn how to become safe, confident, and happy in the water and our focus on providing superior customer service. Swimming Safari is a member of the U.S. Swim School Association, The National Drowning Prevention Alliance, World Aquatic Babies and Childrens Network, The Jacksonville Chamber of Commerce, Stopdrowningnow , SafeKids of Northeast Florida and Women BusinessOwners of North Florida. The success of our company is based on the quality of lessons our instructors provide. I learned this very early on. If we can train our instructors to be inspirational to our children, and professional for our parents and filled with the knowledge and direction we provide, this will be a win-win for everyone!